SawStop is an impressive brand of saws and other products that are known for being top of the line. In fact, SawStop has an extensive line of products for customers to take advantage of at a price that is extremely affordable. SawStop has a large menu of contractor style table saws of all sizes and we have covered a few in our table saw reviews. 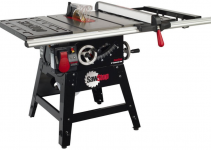 One of the most popular products from SawStop is the CNS175-TGP52 model. This model is full of features that users have fallen head over heels in love with. The CNS175-TGP52 contractor style table saw from SawStop is made with the highest quality materials known to man. There has never been a better time to purchase your own CNS175-TGP52 contractor style table saw from the best brand in the business. It is available in a wide variety of outlets, but prices can vary from location to location. The CNS175-TGP52 saw has numerous features that users rave about. The sharp professional grade appearance of the saw is not only easy on the eyes. 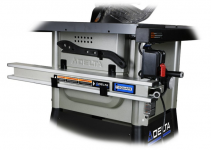 It also gives off a professional aura that gives users the ability to rest easy knowing they have one of the most reliable saws on the market. This model has a one and three quarter horsepower engine that is gentle enough for simple tasks, but heavy duty enough to handle tough jobs. The safety feature in this model automatically stops the blade when it comes into contact with skin. No other contractor saw model can even begin to compare to the advanced safety features that the CNS175-TGP52 model is equipped with. The T glide fence has rails as well as an extension table. The T glide fence is a whopping fifty two inches which is the size of most professional grade saws. The work surface can be expanded. A secure lockdown that does not deflect is another popular feature that users like about this saw. There is a mobility cart and job site cart included with the purchase of this product. There is a one year limited manufacturer warranty that covers any problems with the material or functionality of the saw. The warranty does not cover misuse of the saw. It is possible to purchase an extended warranty when buying the CNS175-TGP52 model. The product dimensions are eighty five and one forth inches wide by forty five inches in depth by thirty four and three quarter inches high which allows plenty of work space for any task. The perks of purchasing the CNS175-TGP52 model from SawStop are endless. It can be used for a wide variety of projects because it is versatile and portable. It is lightweight enough for one person to move it by themselves without any hassle. The product is made from long lasting materials that are practically rust proof when exposed to the elements. Most of the keenly designed saw are made from one hundred percent aluminum. The blade can tip to the left which helps prevent wood from becoming jammed against the fence. The powerful motor can handle any project, but does not make a lot of noise when in use. It has an amazing maximum depth cut that is approximately three and an eighth inches. There is not a lot of complicated assembly involved with this contractor style saw. A step by step guide with detailed instructions and pictures makes assemble easy and hassle free. A comprehensive owner’s guide is included with purchase that provides all the stats and maintenance information users need to know about the CNS175-TGP52 model. There are not many bad things that can be said about the CNS175-TGP52 table contractor style saw from SawStop. The biggest con associated with this model is the fact that two thousand dollars may be out of the price range of some consumers. However, considering the high professionalism of the saw, it is worth every single penny. What do Other Customers Say about This saw? 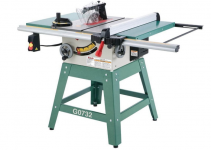 There are tons of reviews where users rave about the endless perks and benefits that come with the purchase of SawStop’s CNS175-TGP52 model contractor table saw. It has a four and half star rating on Amazon. It scores high marks all across the board when it comes to functionality, design, and power. Users love the safety system and adore the fact the motor is powerful, but does not make a lot of racket. All in all, the CNS175-TGP52 contractor style table saw is a great choice for anyone who is the market for a top of the line saw. This saw has impressed many users from around the country to around the world. Get yours today to enjoy the numerous benefits.